Femme Essentials has been scientifically formulated to provide key nutrients important for promoting health and well-being in women. 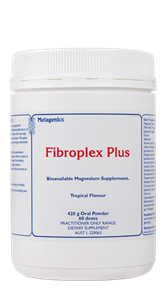 It provides vitamins and minerals to support energy production, healthy detoxification, healthy ageing and optimal cognitive function. Calcium, Magnesium, Boron, and Vitamins D and K combine to maintain healthy bones and normal muscle and nerve function. Folate, B12 and Iron can assist in supporting normal blood and heart function. 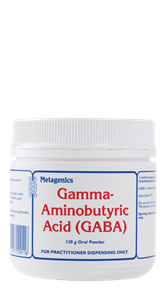 Broccoli sprout extract has been included in this formula for antioxidant support. Broccoli sprouts contain sulfurophane glucosinolates (SGS) which have been shown to activate the body’s natural detoxification system. 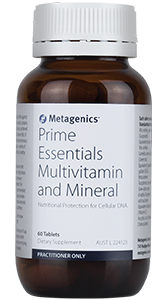 The formula combines the benefits of antioxidants, vitamins and minerals to provide an effective dietary supplement for women. This combination is beneficial all year round, and may be particularly beneficial during times of stress. Directions: Adults: Take 1 or 2 tablets daily with food or as directed by your healthcare professional. 5 mg of elemental iron, in the most advanced, covalently bonded chelate form for maximal absorption. Detoxifying and antioxidant power of broccoli extract: Femme Essentials provides a patented, therapeutic cultivar of Broccoli sprout powder – standardised to contain 6% glucoraphanin. Glucoraphanin gives rise to Sulphoraphane, a potent inducer of Phase II detoxification enzymes. Studies show a diet rich in cruciferous vegetable such as broccoli, brussels sprouts, cabbage and cauliflower can be extremely beneficial to health. 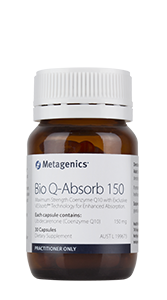 Induction of Phase II enzymes such as glutathione provides an antioxidant activity that is significantly stronger than vitamin based antioxidants, and is effective throughout the entire body. Importantly, sulphoraphane triggers a broad spectrum defence against free radicals, including peroxynitrite, which is poorly handled by direct antioxidant nutrients. Each tablet contains the equivalent of 2000 mg of fresh broccoli sprouts, which is the equivalent of 350 g of cooked broccoli. 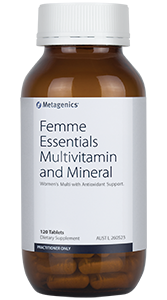 Increased levels of important vitamins and minerals: The new Femme Essentials formula contains significant increases in iodine (for healthy hormone production), calcium (for optimal bone density), magnesium (for healthy nerve function), selenium (to support detoxification) and 150 µg of elemental chromium per tablet (to support healthy blood sugar metabolism). Vitamin D3 has been increased from 100 IU to 500 IU, providing additional support for bone density and healthy immune function. High quality, easily-absorbed minerals: Femme Essentials contains the most advanced forms of chelated minerals (covalently bonded) to maximise absorption and delivery to cells. Copper free formula: Many Australian’s and New Zealanders have excessive levels of copper, which may compromise zinc absorption and lead to hormonal imbalance. New Femme Essentials is copper free to help ensure a healthy mineral balance in your female patients. WARNING: When taken in excess of 3000 microgram retinol equivalents, vitamin A can cause birth defects. If you are pregnant, or considering becoming pregnant, do not take vitamin A supplements without consulting your doctor or pharmacist. The recommended daily amount of vitamin A from all sources is 700 microgram retinol equivalents for women.